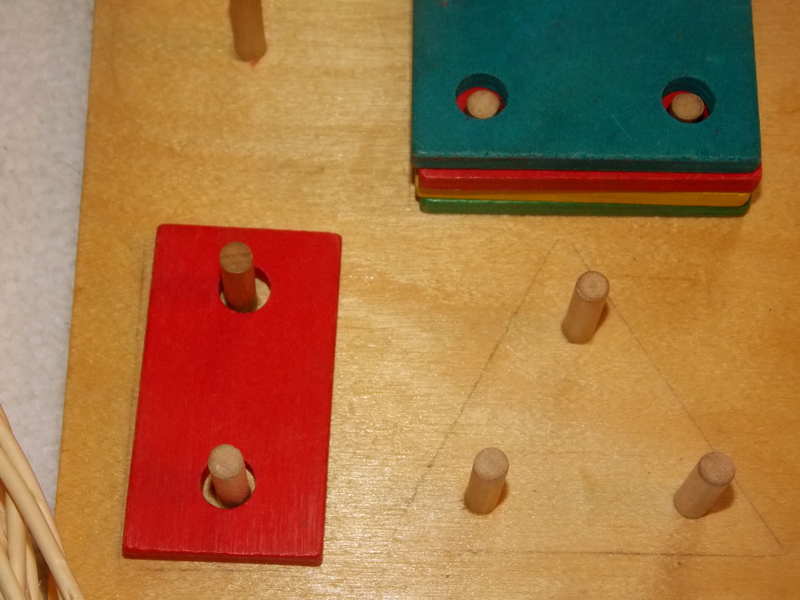 We’ve had this geometric sorting board for a while, and I see it around the web fairly often in Montessori circles. In the past six months (from about 20 months on) I’ve occasionally offered it to Jasper, who over time has enjoyed exploring the shapes, pointing out the colours, and hanging the shapes randomly from the pegs. The idea that certain shapes would fit together on particular pegs wasn’t really happening, even with modeling. Then I remembered this post from the awesome German-language Montessori blog: Eltern vom Mars. It’s the simplest solution in the world: tracing each geometric shape onto the board. I used pencil so that down the road, we can raise the stakes by erasing the shapes. 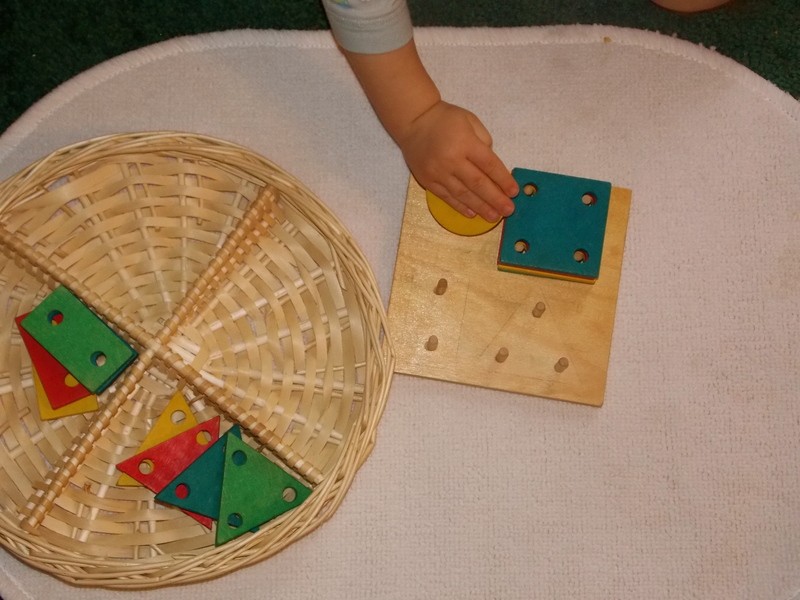 Immediately this has become one of Jasper’s most-often used activities, and paired with this four-section basket, it also provides opportunities for sorting by shape or colour. It’s such a simple hack, and I can’t believe it took me this long to remember it. I can’t remember where our geometric sorting board came from — I know it was second-hand, either from a store or a friend — but you can find something very similar here (that set actually looks a bit chunkier and would be easier for a young toddler to use). If you’re worried that this might make it too easy, I’d say observation is your friend. If the child is focused and engaged with the work and is drawn to it over and over, then it’s just right. When the time comes that Jasper is losing interest, I’ll probably put it away for a while, and then reintroduce it on our shelves with the pencil lines erased. Have you discovered any “Montessori hacks” for independence? We have made many “hacks”. When you have a smallish child as we lovingly refer to Quentin, even the Montessori world could uses some tweaks. Our tweaks: tape a skewer onto your beading string to help little hands, replace the hanging loops on the handles of the Practical Life cleaning tools with Elastic bands so it’s easier for little hands to stretch them open, cut kitchen sponges to fit the child’s hand for easier gripping, tie loops of thread to zipper pulls for an easier grip. And then of course we have also modified some of our materials to include a control of error like you’ve done with the puzzle. Thanks Beth! You’ve reminded me of one more: the ribbon button snake didn’t work well for Jasper to begin with, so we use a pipe cleaner for a little extra stiffness, similar to the skewer on the beading thread. We did a lot of hacks before I opened the daycare and was kind of “forced” to invest — I miss the brainstorming and fun of creation of making our own solutions.